"People are saying that this year's talent is the best yet," host Ryan Seacrest says, kicking off Tuesday (Feb. 19) night's performances by the season's American Idol Top 12 Men. I guess that's why I'm weathering the flu to perform my recapping duties. If I miss somebody, it's 'cuz I went into a coma. Song: "In The Midnight Hour"
My Take: It's an odd gospel-inflected arrangement of the song and David looks to be getting a big dose of reverb, which actually helps his tone. Some of the affectations that bugged me from David's audition footage is absent here. There's no grunting or excessive falsetto. Until the end, he resists the urge to oversing (though he mangles that last note). He also resists the urge to move his feet once he gets to the middle of the stage. Randy, Paula and Simon (witty name swapping to start tomorrow) say: Randy was "Like yo" and says he fell apart a bit at the end, but that it was still a good start to the night. The competition is on, Randy helpfully informs us. Paula calls his vocals brilliant and his vibrato perfect. It was better than Simon expected, though he urges David to loosen up a bit and to be distinct. Song: "I Love You More Today than Yesterday"
My Take: We can only assume that Chikezie got sick of people pronouncing his last name as "Easy" and dropped it entirely. What color would we say Chikezie's suit is? And how much weight has he lost? The Chikezie we met in San Diego was playfully round. I'm not sure I'd even recognize this guy. I think he's lost 10 pounds since the Idol party last Thursday. Meanwhile, if I seem to be getting distracted by external factors, there's a reason. Nothing Chikezie does is good enough or bad enough to draw my attention -- he's got better stage presence than David, but his vocals fall short. Randy, Paula and Simon (witty name swapping to start tomorrow) say: We made it to the second performance of the year before Randy whips out his first "It was aight." He accuses Chikezie of being old-fashioned. Chikezie's come a long way and he's here, Paula opines, in one of those statements that you couldn't disagree with even if you wanted to. Chikezie's weight-loss earns near-tears from Paula. Simon calls him "Jacuzzi" and says he absolutely hated the whole performance. "To be honest with you, this could have been something we filmed 40 years ago," Simon says. Chikezie tries correcting Simon's understanding of his performance. Talking back to Simon at this stage in the competition is never a good idea. My Take: Even after the elimination of his soul patch, David's fashion style looks to be "hobo chic." He's singing my favorite Golden Grahams theme. The arrangement is initially spacey and eventually rock-y and David does better in the latter mode. He's trying to do the Constantine eye-flirt, getting all squinty whenever the camera comes in his direction. David is the night's first singer to have to fight to compete with the band, but after getting downed out in the middle, he comes through OK. Is anybody going to point out that David's floppy hair is a comb-over and he's nearly bald underneath? Randy, Paula and Simon (witty name swapping to start tomorrow) say: It was a little weird for Randy at first, but he worked it out. Paula calls it worthy of great praise. Simon thought he shouted in the middle, but that he almost made the arrangement of the song believable. My Take: Jason Yeager seems to have a 15-year-old son. Even if the kid is really eight or nine, it only reinforces my feeling that Jason is a middle-aged man in a competition that values youth and he doesn't help matter by doing the most old-fashioned rendition of "Moon River" imaginable. We've had three straight attempts to rearrange the '60s songs in different contexts, but Jason goes straight-up Andy Williams, which isn't surprising for a guy who's been making his living in Branson. The tooth-y smile and welcoming arm gestures are pure schmaltz and Jason descends into a near-whisper by the end. Randy, Paula and Simon (witty name swapping to start tomorrow) say: Randy says that all the guys can blow, but that Jason's concentration wavered. Paula did her first ballet recital to "Moon River," so it's got sentimental value. "I bought my first puppy to that song," says Simon before calling very "cruise ship," warning that it will confuse younger viewers. "You're like a dependable old dog, aren't you?" Simon asks. Jason is mighty gracious when it comes to the criticism. My Take: Robbie is 26, but he's an old 26. He looks like a man in his second or third act. "One" is a change-of-pace song more than a piece to prove your rocker credentials, no matter what Robbie's bandana, pocket chain, and leather wristlets might be trying to argue. It's like he's auditioning to play the role of Bo Bice in a road show version of Idol and he thinks the key to winning the part is wearing sufficient flair. Robbie has some pacing problems with the band, but doesn't make any dramatic vocal gaffes. Randy, Paula and Simon (witty name swapping to start tomorrow) say: Randy says it's a nice one and had him rocking out. Paula thinks it was a prefect song. Simon says it's the night's first current performance. Simon isn't sure how authentic he is. 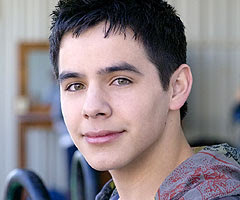 My Take: Say this for David Archuleta -- he doesn't look like he's an old man. I'm not sure I'd have recommended this as a song choice, but David is instantly more memorable than the four -- Five? Six? Three? I've already begun to tune them out -- men who preceded him. He has good camera awareness and plays to the audience without seeming cloying. He doesn't show very much vocal range and he has some rough high notes toward the end, but does anybody honestly believe this guy isn't going to be around through May? Maybe by that time we'll see if he performs every song with the same semi-robotic enthusiasm. Randy, Paula and Simon (witty name swapping to start tomorrow) say: Randy thought that was really brilliant and mature. "I'm like yo, this kid is ready to go," Randy says. Paula thought the song choice was brave and bold. "When you've got it, you've got it," Simon says. David's "Oh shucks" stuttering will get tired in a hurry, but for now it looks genuine. But wait... This feels like only half a recap! Check out the full version over at Zap2it. And if you want some indication of why I've been neglectful to this blog, check out Zap2it's Guide to American Idol.